In the early 30’s there was little use for what some referred to as “the ugly white sand” of the future Panama City Beach. Vast expanses of undeveloped land were obviously only for farming and these sandy acres had little chance of producing anything worth harvesting. Gideon Thomas, however, saw more to this real estate than its critics. Though others made numerous attempts to convince Thomas that his efforts to harvest anything edible in this area were futile, he would simply respond, “I’m not attempting to grow vegetables here I’m going to grow people.” Grow people he did. On May 2nd, 1936, Gideon held the formal opening of Panama City Beach complete with amusement park rides and whole Florida lobsters for 75 cents each. It was then that the life of this small beach town and the dreams of one man began to take shape. Tourists began flocking in from all over the southeast and Panama City Beach became the premier vacation destination. It is safe to say that Gideon Thomas did indeed produce a “bumper to bumper” crop. In fact, in 1953 state officials recognized his contributions by naming the street you traveled to get to Pineapple Willy’s™ “Thomas Drive”. Things have changed quite a bit since 1936. Buildings have gone up, buildings have come down, property has exchanged hands, and newer, bigger dreams have been realized. One of those dreamers was a young man named William Buskell, better known to all as “Pineapple Willy”. 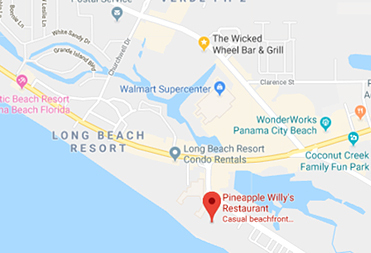 In 1984 “Pine” changed the name of what was then called the Pier 99 lounge to Pineapple Willy’s™. 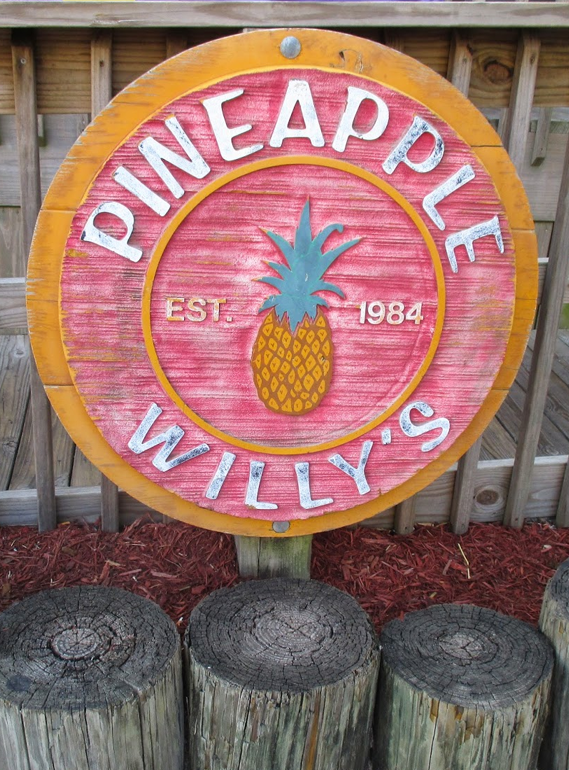 The name derived from the introduction of our now signature rum drink, the Pineapple Willy. He started with the basics: great food, great cocktails, and great staff. Minus a little bump in the road locals refer to as Hurricane Opal, not much has changed here at Pineapple’s. We still serve the best ribs on the beach, you’d be hard-pressed to find better drinks, and the staff is as friendly and fun as ever.